The primary purpose of a real estate website is to help you present your offer attractively, engage potential home buyers, and boost sales. Your site will perform as the online branch of your business, and that is why it is imperative to build it professionally. Certain features must be included for a website design to be efficient, responsive, and easy to navigate. Other attributes are left up to every website owner, a.k.a. real estate business. In a very heterogeneous industry, every niche has its specific aspects. Thus, a professional website will match the business personality and enhance its identity. That is why you will need a flexible website building solution that has all the right tools for you. 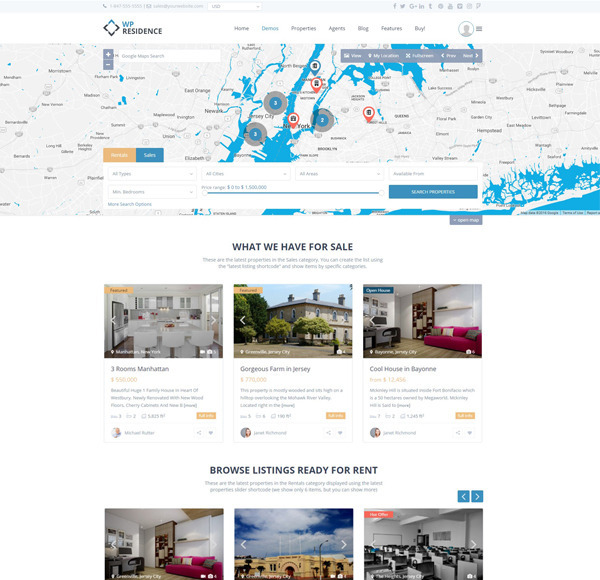 And here comes WP Residence, one of the most featured WordPress themes designed for real estate websites. It provides over 400 options and features, powerful tools and a responsive framework to create an excellent site. Although it is a sophisticated theme, it is easy to get around thanks to the stellar customer support and the comprehensive help guide. WP Estate, the team behind this theme, offers 12 free demos, each one fully customizable, that allow you to mix and match features as desired. Since we, Organized Themes, do not build real estate WordPress themes, we partnered with WP Estate, to share their amazing work. Once you have it installed, WP Residence provides endless design combinations to create a modern and fast website. Whether you are an individual agent, an agency, or a real estate portal, you will find all the options and features you need in one place. One of the top benefits of choosing WP Residence is its advanced search system, which allows you to create endless search field combinations. This versatile feature provides auto Ajax filtering over the map, unlimited custom fields, color customization, custom property markers, and many other options. It is easy for your website visitors to find properties and they also can save their search preferences. Later on, when a property that matches their search is listed, they will receive an email notification. The property listing page is the most visited page of your website, and thus it must attract your visitors with relevant property info and great photography. WP Residence comes with several professional looking list templates, which you can choose to display in grid or list style. From the admin dashboard, you can manage the appearance of your listing page to get a favorable outcome. The latest addition, a WP Residence exclusive, is the Directory design that has specific Ajax search filters for type, category, state, city, area. This listing page type has responsive sliders for property size, property lot size, rooms and price, and a checklist of features and amenities. For every listing page design, Wp Residence has five types of property card designs with a slick appearance. The plan is lightweight and mobile friendly. All card types include hover effects and infoboxes with property status labels and share buttons. The visitor can share, compare, or save the property to his list of favorites in his user site account. Sliders are a WordPress magical tool that allow you to display multiple images attractively and fluidly. WP Residence offers three elegant theme slider designs where you can add the best pictures of your featured properties. The theme provides the option to select the theme slider as your header media for a more significant impact on your visitors. The theme also offers three splash page design variations to better promote your company. These will attract your visitors’ attention the moment they land on your website. You can customize it and add your text, colors, and transparency. The property page is another strong point of WP Residence. Various gallery styles and interactive virtual tours will attract potential customers. Features such as a schedule form, social media share buttons, save your property, print property, Yelp, Walk Score will create further engagement. For SEO purposes, on each property page, you can enable reviews and number of views to increase that trust factor. It is easy to customize the property page by using specific shortcodes. The free demos will enable you to see live examples and play with the endless options. In Google Maps, you can add custom markers or custom price pins and an infobox area with property details. Moreover, you can add your features and amenities to your listings, your cities, regions, and specific fields for different markets, such as the property Energy Rating for European states. Your website visitor is your potential customer and should be able to navigate and communicate easily with you. WP Residence comes with all the options for you to engage with potential buyers. Visitors can sign up and create user accounts where they have several options, such as save searches, favorites, contact agents, and many more. If you run a real estate portal, you can set up different user roles on registration, agent, agency, and developer, and publish their submitted listings. WP Residence allows you to monetize your site by enabling paid submission efficiently. You also can set up different membership packages for each user. The theme works with PayPal and Stripe and with Wire Transfer for offline payments. Agencies and developers have dedicated profile pages and can manage their agents directly from their dashboard. 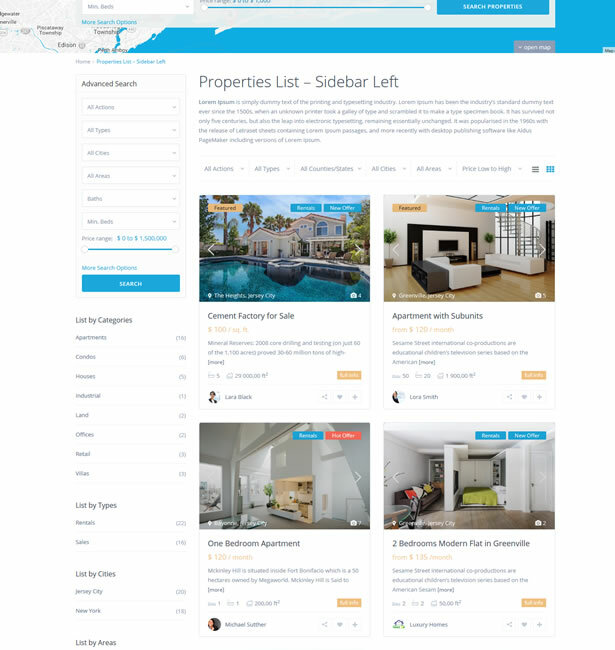 WP Residence allows you to create a personalized page for every agent that includes a description, a profile image, property portfolio and an email contact form. Additionally, each agent can have his specific custom fields, his property markers on Google Maps, and a customer review section. WP Residence WordPress theme was designed to address every aspect of a dynamic industry. As the theme owner, you will have control over every feature, including design, appearance, content and Google Maps settings. You will also be able to manage site speed and export theme options. With countless options to administer the theme’s features and advanced settings, WP Residence is one of the most versatile themes for the real estate market.